A visit to the pediatric dentist should be fun! Children love new experiences, if they are not connected in advance with fears, stress or even pressure. Most treatments today are painless and short anyway. 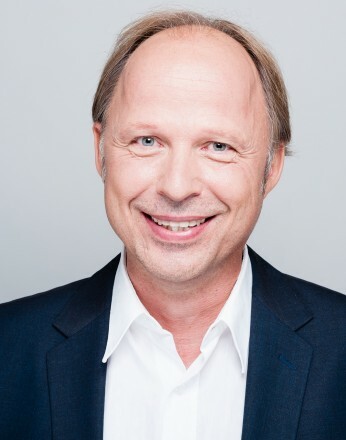 In the practice at Kureck your child is in the best hands with Christof Riffel. Not only because his many years of work with children have given him a distinct “knack” for small patients – his treatment room also offers a child-friendly, fear-free atmosphere. 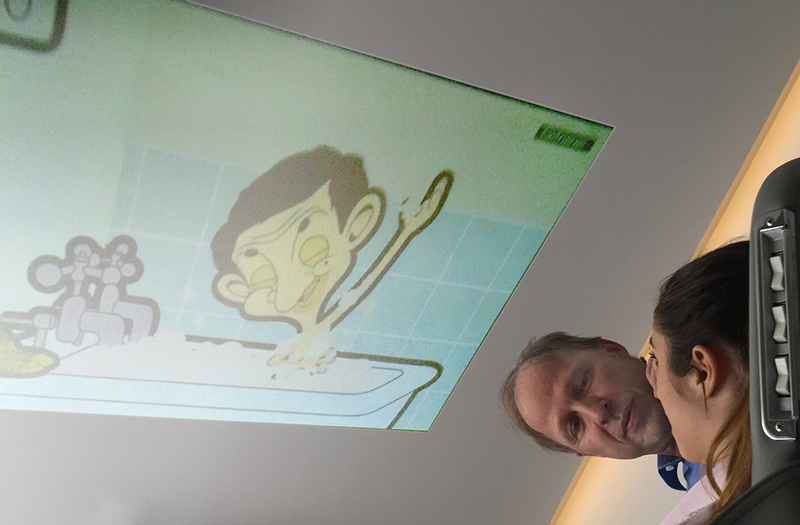 Christof Riffel’s goal is to maintain and promote children’s curiosity and natural willingness to cooperate. Therefore the patients are introduced to the treatment in a playful and child-friendly way. There is no time at all for fear and stress. However, for you as parents we have some tips on this page on how you can prepare your child for a visit to the dentist – although less is really more here. 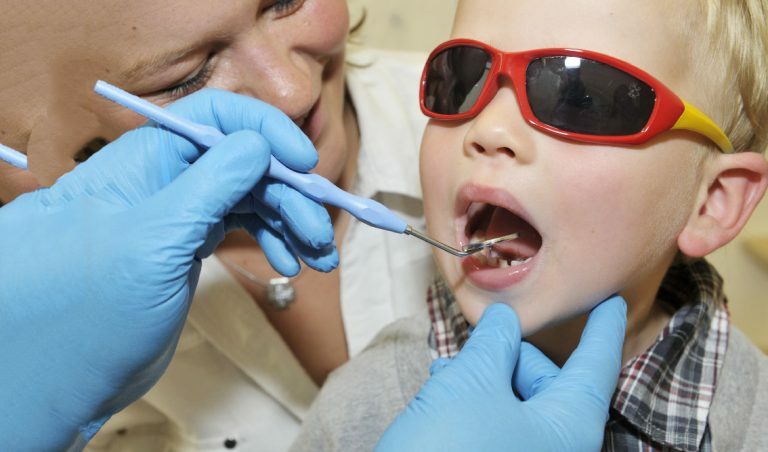 To prepare your child for the first visit to the dentist, it is best to do as little as possible. The child should make his own unbiased experiences with the practice rooms and the nice team. do not calm anything (“that does not hurt at all”), because that only makes the child think that something could actually hurt here. When the child asks if it hurts, say that most children tell it tickles a little. Above all, do not promise any rewards, because this dramatizes the situation and puts the child under pressure. Of course you can be part of the treatment. But keep as far as possible in the background and let the child be the focus of attention. The child should concentrate on the dentist and understand what he or she is saying. Already the way Christof Riffel talks to your child calms and relaxes it and, if necessary, puts it into a slight trance state (dental hypnosis). Let the dentist guide you! This is the best way to establish a relationship of trust between the little patient and his doctor. Some children also want to play dentist and examine stuffed animals – or their own cuddly toy. Arouse your child’s curiosity about visiting the dentist. Make the day of your visit to the dentist free of stress and ensure that your child is rested. Every treatment begins with a thorough diagnosis. The dentist will get an idea of your child and his teeth. The caries risk is determined and an individual treatment plan is based on this. Nutrition, tooth brushing habits and the use of fluorine also play a role. If necessary, critical areas can be x-rayed with very little stress. This makes it possible to detect a dental disease before it is visible or even noticeable from the outside. Even in our times it is not a matter of course to have healthy teeth free of caries. In contrast to 20 or 30 years ago, we do not only want to remove caries in your children today, but we do not want it to develop in the first place. This requires a professional individual prophylaxis program. The young patients are introduced to dental care in our dental practice in a playful way, so that they are motivated for domestic oral hygiene and take personal responsibility for their teeth. Is tooth brushing necessary? Yes. Because a clean tooth does not get sick! Brushing teeth removes not only leftover food, but above all the harmful plaque. Plaque is mainly composed of bacteria and their metabolites. The bacteria multiply rapidly, adhere to the teeth as a sticky mass and produce aggressive acids. These dissolve the enamel so that caries develops. …. is not necessary for milk teeth? Yes! Many children have their teeth very close together. This increases the risk of interdental caries. The contact point between closely spaced teeth is neither visible to the dentist nor accessible to the toothbrush. Dental floss is therefore obligatory even for milk teeth. The prophylaxis team will explain the handling in detail to parents and children in the practice at the Kureck. All teeth with deep grooves and dimples on the occlusal surface are particularly prone to caries. These teeth should also be sealed in children. A medically harmless, low-viscosity plastic is applied to the tooth surface under absolutely dry conditions and cured with a special lamp. This gives your child’s teeth effective protection against tooth decay. There are different types of filler materials. We only use plastics as filling material. Plastic fillings have good adhesion and therefore also a high load capacity. They are more durable. The costs for plastics are not fully covered by the statutory health insurance funds. In some cases caries has attacked the nerve and the tooth needs a nerve treatment. We provide such teeth with a children’s crown. Only then do they have a good chance of success in assuming their placeholder function until the natural change of teeth. Even teeth with a pronounced enamel defect are protected with a children’s crown so that they are fully functional again. Interdental caries is particularly dangerous for the delicate milk teeth. Especially the milk tooth nerve can quickly become inflamed and die due to caries bacteria, even if the hole still looks small from the outside. If the nerve is also affected in teeth with deep caries, treatment is required. In most cases, the diseased part of the nerve must be removed. However, it can also happen that a milk tooth dies. In this case, root canal treatment as in adults is necessary. Optical changes of the tooth, a fistula or an abscess are the external signs. There are many causes of milk teeth dying (accidents, caries). The tooth must always be treated. After each root canal treatment the tooth should be treated with a crown. Insufficient or incorrect treatment (e.g. leaving the tooth in place or drilling it out) can lead to long-term damage to health, for example in the case of a permanent tooth. For a detailed examination, we take a digital x-ray image in the practice at Kureck. If a milk tooth has been lost prematurely due to an accident or caries, the resulting gap must be kept open for the next tooth. This is done using a placeholder. A fixed placeholder is practical: It is firmly cemented in and only needs to be reinserted when loosening.